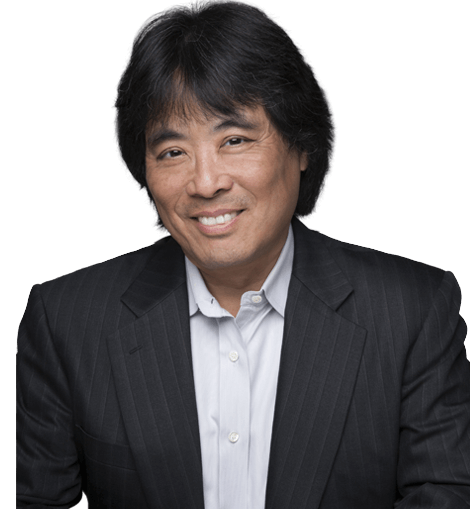 Rick Wong spent 30+ years growing revenue for Fortune 100 companies, small business partners, and his own entrepreneurial pursuits. He exceled in sales, marketing, management, and executive management. He used The Five Abilities® sales framework to intensify focus on increasing revenue while delighting the people with whom they worked. 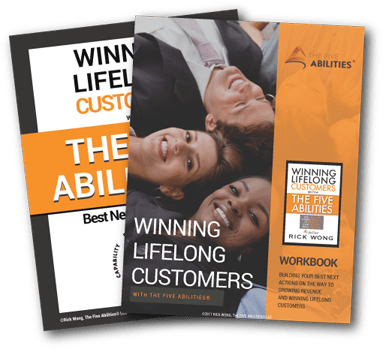 Rick founded The Five Abilities® LLC to help others sell more and delight more, all in the pursuit of Winning Lifelong Customers. Winning lifelong customers is the lifeblood of enterprise selling. Repeat business and referrals keep your business growing and profitable. The Five Abilities sales framework teaches you to master the personal connection side of selling in new and instantly memorable ways. You’ll make habit of executing on The Five Abilities that win you more repeat business from the decision-makers to whom you sell. Consulting specific to sales and revenue related disciplines is available to clients. We start with an introduction to The Five Abilities® sales framework. You then learn to make habit of The Five Abilities while advancing real business opportunities. Our workshops have attendees working on live opportunities. Salespeople learn best when they’re in action so that's how we teach the framework. They internalize new habits by engaging with customers and determining real best next actions. Rick Wong has spent over 30 years in industry where he held executive and management positions. Often clients find his experience helpful with issues that extend beyond pure sales. Rick offers executive coaching that focuses on enhanced performance and problem solving as it applies to all elements of growing the client's business. Rick and I met while doing business in 2000. I was an executive decision-maker—he managed the people selling to me. That business relationship became a friendship that will continue beyond retirement. The Five Abilities is the framework for how Rick does business, one I found very effective leading to win-win opportunities, and how he coaches others to sell. A good read. Rick’s business knowledge and connections in the technology world are an amazing accumulation of his years of experience and success. His assistance in refining my sales pitch and understanding of Asian markets and partners has been invaluable to furthering Symform’s efforts. Rick Wong went above and beyond in growing our medical practice with his Five Abilities concept. He is an exemplary leader, speaker and business consultant that I would highly recommend to any business. After 35+ years in F500 sales, management, and executive roles, Rick Wong has experienced and observed what we present in Selling with Noble Purpose. Salespeople who are consistently top performers are universally driven by the joy of helping and relating with people. Noble intent fuels their competitive nature—not money. It’s a refreshing read from someone who spent a career in the trenches. Salespeople and entrepreneurs in the B2B world frequently fail because they focus efforts on a generic institutional sale, resulting in an inability to break through and connect with potential customers. Rick provides a framework for how to reorient your efforts to reach the key people inside targeted businesses with authentic communications that they will appreciate. Technology has changed the way we find customers and how we help them find us, as I write about in The Wish. However, while the digital marketplace helps us to reach more customers, it doesn’t eliminate the need for a personal connection. People still choose to do business with people they trust. Rick Wong shares an important framework for maintaining focus on the people side of selling, even in today’s technology driven world. Sound insight and a competitive edge are to be gained by reading this new classic sales book, Winning Lifelong Customers. After more than 35 years of successful sales, marketing, executive management, and entrepreneurial pursuits, Rick Wong shares that the best salespeople are driven by helping and relating to others. In Winning Lifelong Customers he introduces a simple framework founded on the principle that people make business decisions for personal reasons. His principles are aligned with BNI’s philosophy that Giver’s Gain® and that success comes to those who help others. A great read. In Winning Lifelong Customers, Rick Wong lays out a very usable framework for doing business on a personal level. This is a timely book in today’s global economy since other cultures, such as China and other emerging countries, demand personal connection before any business can be done. A good read for business people, in general, and certainly those who plan to do business in cultures that prioritize relationship over product. Rick Wong has written a book that reads effortlessly and yet is packed with real world how-to nuggets of information for the most-seasoned salespeople and those just starting their careers. A practical, relevant guide that I will return to often. It will become a well-used dog-eared resource! David Nilsson and I wrote, Making the Jump into Small Business Ownership, which teaches people how to successfully transition into self-employment. Today, I help clients match small business opportunities to their personal strengths and passions. Among the many skills needed by business owners is sales and marketing. 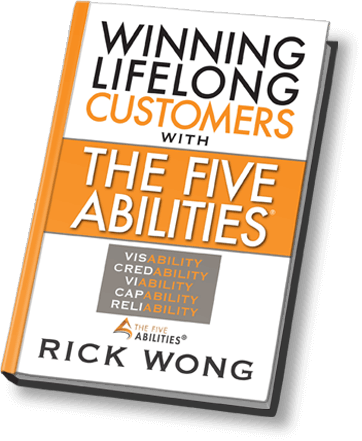 In Winning Lifelong Customers with The Five Abilities, Rick Wong offers a sales framework learned over his successful 35+ year career. His structured method is accessible to all and yet comprehensive in addressing complex sales challenges we all face. A great read. I’m glad that Rick has decided to share his knowledge and experiences in this book. The framework he developed while selling HP computers into an IBM stronghold—Boeing Commercial Airplane Group, won us a lot of new business. It will be a helpful read for any salesperson or sales manager, not to mention the many of us who count on successful salespeople—pretty much anyone in business. A private tour of a salesman’s mind… retold in a structured manner, simple to learn, yet sophisticated enough to deal with advanced sales situations. Rare to see complex sales situations structured into such a learnable, simple, and systematic style. A real-life journey of a self-made, successful sales professional. We rank The Five Abilities® as one of industries top 50 must-read blogs on consultative selling.